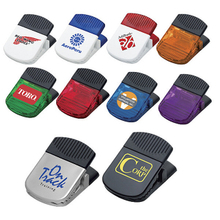 The other customized holder clip mainly includes custom ABS plastic clip with print logo for holder. It is a delicate and practical holder clip. The ABS plastic clip has standard sizes, and we provide several different designs, you can accord to the characteristics of your company or organization to select appropriate one, can also create a unique one by yourself. And we will print your characters and logos on the customized ABS plastic clip, logos and characters on the customized holder clips are not easily scratched or come off. The ABS plastic clip with print logo for holder is made of 100% recyclable plastic, it is environmentally friendly and hard, hard to break it off. So you can rest assured to use our ABS plastic clip with print logo for holder. For more details, you can contact to us!